You asked for a vinyl / plastic shutters that are BETTER LOOKING and MORE FADE RESISTANT than the shutters available at your local big box home center . . . we have them! Click on a shutter style below for pricing/ordering information! 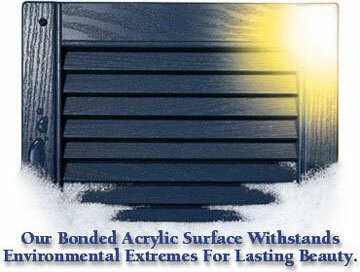 Durable, Care-Free Shutters, In The Sizes, Colors And Styles You Want. Over 50 years of manufacturing shutters to the highest quality standards in the industry. The strong, one piece polymer construction makes these Girardin shutters nearly impervious to water and airborne pollutants. The ability to resist the fading, chipping and cracking caused by the hot summer sun's harmful ultraviolet rays, is more important than ever. In the winter these polymer shutters stand up beautifully to the effects of bitter cold, driving rain, sleet and snow. Great as house, church, business, school, and mobile home shutters, you can count on years of beautiful service! Choose straight top Vinyl louver shutters for a look almost like wood shutters. We give you more selection so you get the right shutter for any job. With 22 lengths from 23" to 81" and six widths from 6" to 18" you're sure to find a perfect fit for any window or door. Most any architectural style will be complemented by one of our three popular designs; traditional louver, cathedral or panel. Your choices don't stop there. All shutter styles are available in twelve rich decorator colors. It couldn't be any easier. All of these Girardin shutters are manufactured with pre-punched mounting holes. This eliminates the hassle of measuring and drilling. Each pair of polymer shutters come with twelve aluminum screws featuring our strip resistant square socket head painted to match the shutter color. To make sure the polymer shutters are ready to install when they arrive at the job site, they come packed in pairs and protected from damage in heavy duty corrugated boxes. Besides reducing the risk of damage during shipping, the boxes make transporting to job sites easier. Great styles, colors, and sizes aren't much good to you if you can't get your hands on them. Delivering the product you need - when you need it, is as important to us as it is to you. That's why we keep 50,000 pair of Girardin shutters in stock. We can ship most orders within 24 hours. For special orders, we can provide you with an accurate manufacturing and shipping schedule. We know that the sooner you have them, the sooner you can finish the job.